On this journey through my childhood writing, it is with no little trepidation that I usher us into the high school era. Midway through ninth grade, shortly before I turned 15, I started keeping a series of notebooks filled with embarrassingly earnest stories and personal musings. 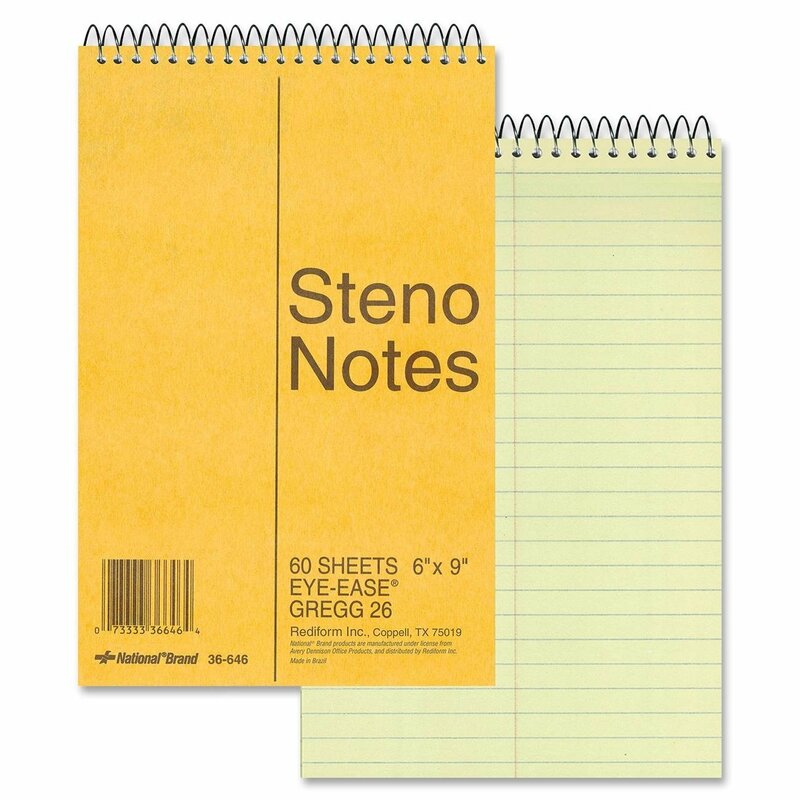 I wrote exclusively in steno notebooks because that's what some character did in a novel I no longer remember, and much of the work inside springs from a similar pretentiousness. Up to this point, it's been fun to mock my early writing because it all seems so childish. Everything I've shared is either exuberantly ridiculous or surprisingly competent, and I can read it while mentally giving my young self an encouraging but patronizing pat on the head. The last story I posted, Crime Doesn't Pay, is more difficult to laugh at, because despite the clumsy dialogue and excessive cliche, I see signs pointing in the direction of the writer I am today. In my high school notebooks, my maturation as a writer continues, with all the awkwardness that entails. Unlike the eighth grade story, written to be turned in for a class, the contents of the notebooks were private and uncensored. I've only started looking through the books, and I'm already fascinated and surprised to discover what I was preoccupied with at 15. So far, the prevailing themes are religion and death. I'd thought I might ease myself into the high school era by first posting some class assignments, but instead I'll plunge right into the mortifying end and let you see two of these religion-and-death stories. These two works are also notable in that they are examples of a few stories I revised, purely for my own satisfaction. I wrote first drafts in the notebooks and much later, the following year, revised them on my computer (and was foresightful enough to note this in the documents for my future archivist). PLACE: Cassandra's bedroom. A "typical" teenager's room. Moderately messy. Center stage is a single bed. Near the bed is a stereo. CASSANDRA: [Looks up, still crying. She says the next half as an accusation, half as a fact.] That was our song. JEFF: Yeah, I know. [Pause] So why were you listening to it? You knew you'd cry. CASSANDRA: [Annoyed] Jeff, it's a funeral. You're supposed to cry. JEFF: [Trying to make a joke] Yeah, but you aren't at the funeral yet. JEFF: Cass, I'm sorry. I'm an insensitive jerk. CASSANDRA: [Rolls over and sighs] Nothing. JEFF: Are you ready to go? CASSANDRA: No. What time is it? JEFF: [Looks at watch] Twelve thirty-six. Funeral starts at one. CASSANDRA: [Staring at ceiling] Jeff, why did she have to die? JEFF: [Rubbing face with hands] I don't know, babe. I'm not God. CASSANDRA: [Suddenly rolling over to look at him] Do you believe in God? JEFF: [Caught off guard] Oh, I don't know. I guess so. I don't really think about it much. CASSANDRA: I do. Think about it, I mean. JEFF: So, do you believe? CASSANDRA: [Slowly, hesitating] No. No, I really don't think I believe in God. CASSANDRA: [Picking at the bedspread] No, it's not that. There just doesn't seem to be any, any point to it, you know? And no proof. Like, listen to this: The ancient Greeks and Egyptians and all them had their gods, right? But do you believe in Zeus? JEFF: What? Is that a rhetorical question? JEFF: Well, no. No, I don't believe in Zeus. CASSANDRA: Right. And in a thousand years, some culture's going to have new gods and they'll teach Judeo-Christian mythology in school. JEFF: [nodding slowly] Yeah. I guess so. CASSANDRA: And when you studied mythology, why did they say the ancient cultures invented the gods and stuff? JEFF: To explain things, right? Like snow and seasons. And life and death. CASSANDRA: [Excited. She is on to something and she wants her brother to understand.] Right. And when the teachers told you that, it was always as if we weren't doing the same thing ourselves with God and Jesus and the Bible. The Bible is just our myths. And God's just to explain things. He's not real. [By this time she is sitting up on her knees and gesturing.] Don't you see? There just isn't any reason to believe! JEFF: [Rather taken aback by this outburst, trying to pull his thoughts together] But, but Cass, that's just the reason to believe. So you can think that Alex is in heaven and not a body in a coffin. You don't have to prove God, just believe. That's the whole point. CASSANDRA: Jeff, that's it! You've done it! CASSANDRA: Figured it all out! I thought so hard about God that I couldn't believe even if I wanted to. But you're right. That's not the point. [Throws her arms around him] Jeff, you're a genius! JEFF: Uh, thanks. Are you ready to go? CASSANDRA: [Sighs, wipes eyes, straightens clothing] Ready as I'll ever be. JEFF: So, Cass, do you believe in God? CASSANDRA: I believe that Alex is happy. Much of what's in my notebooks is unfinished, and for a while, that was the fate of "Proof of Existence". I wrote the beginning, up to "What time is it? ", and then flummoxed by a response (or more likely, bored with the idea), I moved on to something else. Four months later (I dated all my entries), I apparently saw some potential in the premise, because I continued the scene. Most of that first draft is similar to the final version. I made good revision choices to streamline and improve the flow of dialogue, and I removed one pointless exchange that has Cassandra saying "I don't know why I said that" while "blinking, looking puzzled" as I guess she recognized things were going off the rails. The big revision change comes after Cassandra concludes that God isn't real. The first draft falters at that point, reaching for a ending with another round of Cassandra crying and Jeff comforting her, and it trails off in the middle of a stage direction. I'm unconvinced by Jeff's insight in the final draft, but this turn does bring the scene to a definite resolution, so kudos to Teen Lisa for identifying and fixing a serious first draft problem. I could barely bring myself to read the next story, "A is for Autumn And...", let alone post it, so you're in for a real treat. See if you can spot what the "..." refers to. We sat in lawn chairs in my back yard on one of the last mild days of the year. Still it was cool enough that I was wearing a flannel shirt, and Matthew, who could never get warm anymore, was in his overcoat. The late afternoon sun lit the trees on fire. The brilliant colors of the New England autumn were intensified by the clear, crisp air. I was feeling really content for the first time in a long while. I broke the lengthy silence to make a trite remark about the weather. "Have you ever seen such a gorgeous day?" I sighed. Matthew turned his head toward me and grinned. "Quick, get your camera. I think it's a Kodak moment." I laughed, for once not irritated at his inability to be serious. "Maybe I will. You're looking pretty good today." He looked away to the trees. I could see the hollows in his cheeks and around his eyes. The Angel of Death, Matthew called himself. But now there was color in his skin from the sun and the fresh air. "Please, Audrey. Flattery will get you nowhere." He looked at me again and wiggled his eyebrows. "But a few bucks might do the trick," he continued, Groucho-style. I scooped up some fallen leaves and threw them at him. He plucked a bright red one off his coat and twirled it by the stem, regarding it intently. "I think," said Matthew slowly, "that I find fall rather depressing." He stopped, pulling his mouth to the side, as was his habit when he was thinking. "Go on," I prodded him softly, hoping that I could get him into a serious mood for a few minutes. Matthew shook off his reverie. "What?" "Tell me what you were saying. About fall." "Oh, fall just depresses me. I think about my childhood. You know, starting school? Always hated that." He made a silly face to show me he was kidding, as if I couldn't guess. "Matthew, you're full of it, you know that?" He pretended to be shocked. "Don't give me that! I'm serious!" I insisted. "I know, Audrey," he said gravely. "We're really going to have to work on that." "Oh, Matt," I pleaded, "why the hell can't you be serious for just a minute? You really make me mad sometimes." "But, Audrey, you look so beautiful when you're angry." "You just don't know when to stop, do you?" I snapped. There was a long moment of silence. "I'm sorry," Matthew said genuinely. "My shrink says humor is my defense mechanism." "Defense from what?" I asked, pacified as usual by his apology. "Oh, reality, death, society, that sort of thing," said Matthew. "Of course El Shrinko went into much more detail than that to fill up my fifty minutes. You would not believe what this guy charges!" "So why do you keep seeing him if you don't like him?" I asked. "Oh, I like him okay. I just don't like to admit I need counseling. Besides, he's really good-looking." "Oh, well. Too bad for both of us." Matthew nodded, and we lapsed into silence. There was a gust of wind, and we both shivered. After a few minutes, I decided to ask the question that had been in my mind all afternoon. "Matthew," I began, "do you believe in God?" He looked at me and raised his eyebrows. "Planning my funeral again, Audrey?" I shrugged. "I want to know. It's important." "Is it?" he mused. "Okay. But you first. Do you believe in the supreme being of your choice?" "I find it reassuring," I said, daring him to make a joke. He didn't. "Okay, fair enough," he said simply. "Now you," I prompted. "And don't tell me you've always wanted to be a priest, like last time." "Why not? There should be more Jewish priests." "Okay, okay. I think that God," he paused for dramatic effect, "is a ten-year-old boy and we're all part of an enormous Nintendo game." "Matthew!" I tried to be exasperated, but he was too funny. "I'm sorry, Aud," he said, laughing at the look of despair on my face. "I just can't believe in a God that would create AIDS. And I'm not about to think I'm being punished for being gay, am I?" He was serious now. He put his hand on my shoulder. "Hey, kiddo, don't look so perplexed. Just plan a nice non-denominational funeral and have all my friends say how wonderful I was." "No, it's not that..." I began. "What? Didn't I ever tell you I was gay?" We both burst out laughing. "You," I said, shaking my head in despair. "No, it's just what you said. About God. I mean, you're right." "Audrey," he interrupted seriously. "Don't. Do not become an atheist because of what I said. You believe in God because it reassures you. I don't because it doesn't. Don't worry about it, okay?" "Right," Matthew said. "Now about my funeral. I want the Mormon Tabernacle Choir to sing 'Like a Virgin'..."
I shook my head again, but this time I wore a big smile. Did you get it? The other thing that starts with A is AIDS! It was 1990. When I constructed romantic stories about lingering illness, that perennial favorite of teenagers, it was usually AIDS. The first draft of this story is significantly different from the last. In what I wrote originally, after Matthew says he finds fall depressing, he goes on to explain that it's the season of dying, and the characters discuss whether or not dying can be beautiful. When Audrey asks if he believes in God, he starts with the joke about God being a ten-year-old boy, but then gives a serious answer: "I've decided that I still can't decide. I just hope that there is life after death, and that it's better than this one. And I hope I'll be happy and I'll be in the same place as Greg." There's further discussion of the afterlife, and similar to the original ending of the previous story, the scene ends with Audrey crying and Matthew comforting her. Following this, I wrote two sentences to start another scene taking place after Matthew's death, but evidently I didn't have any further ideas for expansion. The version I ended up with, in which Audrey is frustrated by Matthew's refusal to be serious, is at the very least a more interesting direction to go with the material. And it wisely omits the line, "It's amazing how one little retrovirus can ruin your whole day." Now let us never speak of this story again. → Sarah Knight at Book Riot worries about Reviewing Bad Books When You're Part Of The Literary Community: "Being part of this community is wonderful, but it also means I feel like I can't always tell the truth about the books I don't like, because someone is going to see it and get their feelings hurt." I actually love that retrovirus line, in the context of Matthew's character. And I like the second story as a whole (at least with the "15yo author" disclaimer). I find it interesting that you're so uncomfortable with it--pretentiousness is more embarrassing to you than other metrics of quality? I think if I was able to read the story objectively, say if somebody else had written it at 15, I'd also consider it a decent enough sample of teenage writing. I guess what makes it so embarrassing as my own work is that the story feels deeply personal, not because I had any experience whatsoever with the situation portrayed, but because it encapsulates so much of what was swimming around my brain and occupying all my stories at that time. Like, there's other stuff I know I won't be posting because it's purely autobiographical about things I'm not comfortable sharing, and this isn't autobiographical at all, except it feels just as revealing. There's also the thing I called pretentiousness, though that's perhaps not the most accurate word. It's knowing that I found every line of these stories so clever, funny, or insightful at the time (especially since I carefully revised them), which makes me cringe to read them now with a different opinion.